A great place for relaxation, peace and quiet. Countryside views. If you are looking to escape to the country for a relaxing break, Sunset Barn is the place for you. 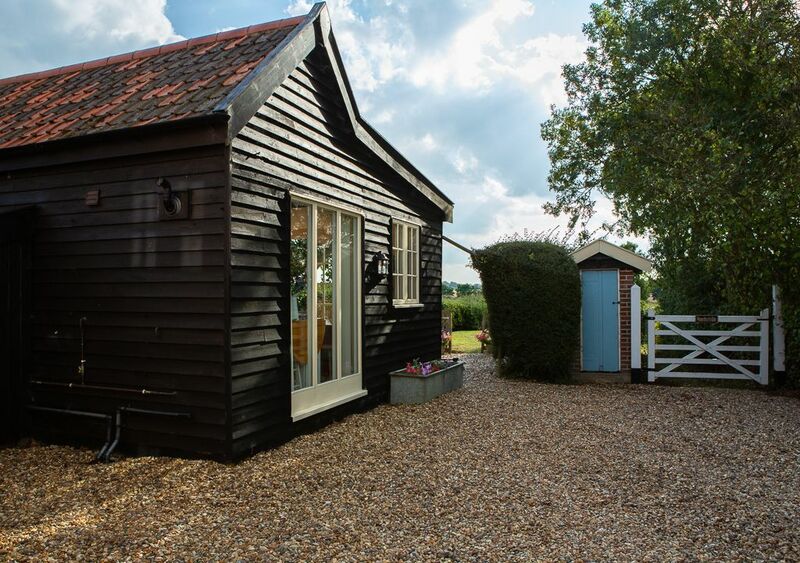 Sunset Barn is tucked away at the bottom of a very quiet lane with countryside views all around. We are about a 30 min walk to The Farmers Kitchen and approx 25 min walk to The Wortwell Bell Pub where you will find some great food. We are loaded in between the market towns of Bungay and Harleston, Beccles is also easily accessible along with the beautiful Soulwold coastline. Norwich and Bury St Edmunds are also great places to visit. is a fabulous City to visit and is just 16.2 miles away. Bury St Edmunds is also a great place to visit. Outdoor furniture is supplied. There's lots of places to cycle to and the biggest bonus for me is that most of the roads are flat :-) There are lots of beautiful countryside walks right on the door step. Canoes are available for hire in Bungay should you fancy a day on the Waveney River. My husband and I have lived in Alburgh for 5 1/2 years and love the slower pace of life after living in South Manchester previously. If you are looking for a relaxing break surrounded by beautiful countryside, this is the place for you. The historic City of Norwich is easily accessible along with the beautiful Suffolk coastline. Detached. Private. Countryside views. Quiet. Great walks on the door step. Private garden. Bath with shower over and glass shower screen. Canoes can be hired at the Waveney Caravan park approx 6 miles away. A great day out on the Waveney river. Bungay golf course is a short drive away. A delightful place to stay... soooo peaceful. The owners have thought of everything and were super welcoming and respectful of privacy. Would highly recommend. Thank you for taking the time to write a review Julie. It was lovely to meet you and we look forward to seeing you again sometime in the future. Thank you for taking the time to write this review. It was lovely to meet you both and I’m really pleased you enjoyed your stay so much :-) I hope to see you again sometime. Beautiful quiet and gorgeous sunsets. Clean and tidy . A lovely welcome pack of eggs butter bread and milk. Everything at hand and a lovely setting at the end of a quiet lane. Great area for exploring Norfolk and Suffolk. Parking for your car and use of the hosts garage for your bikes if you bring them. Thank you for taking the time to write a review. I’m really pleased you enjoyed your stay. It was a pleasure to meet you both and hope to see you again sometime in the future. Donna was a perfect host, very accommodating. The barn was everything and more. We would love to visit again. Sunset barn was a perfect preacful hideaway . Would definitely recommend this place. We got a chance to experience the hot sunshine and rain during the stay. Our hosts were very friendly and made sure we had everything needed for the stay. Highly recommended for a quiet getaway for couples. It was so lovely to meet you both and I'm so pleased you enjoyed your stay. I look forward to seeing you again sometime in the future. Boating on the Waveney river. Bressingham Steam Train. Oasis Camel Centre. Africa Alive. Southwold coastline. Lowestoft Coastline. The Quay at Beccles. City of Norwich. Bury St.Edmunds. Wymondham Abbey.